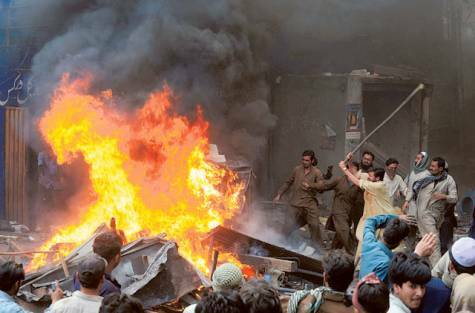 Thousands of angry protesters on Saturday set ablaze more than 100 houses of Pakistani Christians over a blasphemy row in the eastern city of Lahore. Islam shows its true face in the Pakistani city of Lahore. Hundreds of people besieged the colony and about a hundred houses were burnt or ransacked in the Badami Bagh area, part of old city. Police sources said that Sawan Maseeh, a 26-year Christian allegedly made derogatory remarks that angered the Muslim residents of the neighbourhood. The police took the man in custody and moved him to a secure place. However, the unruly crowd carrying sticks and stones attacked the homes of Christians. A church was also partially damaged, sources said. Islam is presenting it self as a religion. Not only is Islam claiming to be “faith based”, but even to be the religion of “peace’. In the Koran, there is more than 140 verses where the “prophet” Muhammad demand use of violence, and call for “Jihad”. «The just retribution for those who fight GOD and His messenger, and commit horrendous crimes, is to be killed, or crucified, or to have their hands and feet cut off on alternate sides, or to be banished from the land. This is to humiliate them in this life, then they suffer a far worse retribution in the Hereafter». There is very little difference between the teaching of Nazi-leader Adolf Hitler, and what the Koran teaches. The rise of Nazism was also “Jihad” or a “Holy war”. The Jews where the ultimate enemy, and also evangelical Christians were targeted. The “Christ” of Nazi-Germany worked for the German”caliphate“, or total World domain and control. Its is worth reflecting on the Pope. 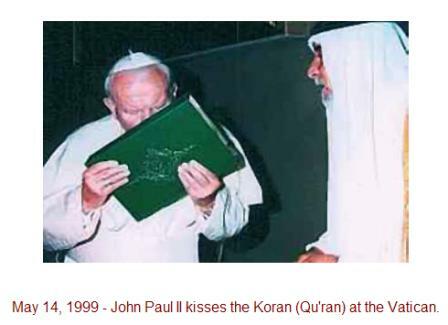 kissing the Koran. It is also worth reflecting on, that Hindus seems to have better discernment than many claimed to be Christians. While Muslims can freely flood the gates of Europe, their entry into India is restricted. In particular Pakistanis will find it difficult to get a visa, and their activities inside India will be monitored. India has learned the hard way, what Islam is all about. One million Hindu’s were slaughtered when the Islamic republic of Pakistan was born. Pakistan was ethnically cleansed for Hindus. Inside India, 200 millions Muslims have Indian citizenship, and have renounced the Islamic agenda. India was formed in 1947, and Israel in 1948. Both nations included their Muslim population, and gave them all rights as citizens. Still Koran-based Islam targets both India and Israel. Islam is a violence ideology. It is the ideology of barbarians, that must be contained. Those who accept Islam is the civilized world are a Fifth Column, who side with the enemy of freedom of speech, democracy and basic human rights. Muhammad is a false prophet, and an evil doer. As so are all who kisses the Koran. and claim this to be a “holy book”. Including the Pope in Rome. Jesus the Messiah is the Son of God, the savior of the World. Serve Him only. 200,000 muslims killed in Assam in 2012; is absolutely rubbish. Where and when? Examples please. I’ve Reblogged you, with pleasure. Great work!